On the surface, December is a great month. It's filled with holidays: Christmas, Hanukkah, Kwanzaa, Boxing Day, and a host of other special occasions. The 22nd is the winter solstice, the day when the Earth's natural calendar turns and days start getting longer, and the 31st is the night when the old year ends and a new one begins. But for all its holidays and festivals, turning points and celebrations, December also has its fair share of grim anniversaries. The 7th, after all, remains a "day that shall live in infamy," and the 2nd is the day that Enron filed for bankruptcy. On the 11th, Bernie Madoff was arrested, and on the 14th, President George W. Bush was hit by a tossed shoe in Iraq. Five years ago, December added another infamous event to its collection: According to the National Bureau of Economic Records, December 2007 is the when the U.S. economy peaked and the Great Recession began. That month, unemployment crept up to 4.9%, beginning a slow climb that would gather speed in 2008 before reaching its height in late 2009. Three months after December 2007, the famed Bear Stearns bailout hinted at the Wall Street mayhem that was in the works. Of course, by then, the rise in unemployment was hard to miss: In February, employers cut 63,000 jobs, a five-year high. Over the ensuing months, those numbers would continue to rise as the jobless rate eventually topped 10%. Five years later, the economy still hasn't recovered. Unemployment hovers just below 8% -- an improvement over the worst days of the recession, but far from its pre-2007 levels. The number of underemployed workers is still high. And while the recession has officially ended, the effects it had on the middle class remain, in particular what many analysts have characterized as an unprecedented loss of wealth. At the same time, the Great Recession also led to an explosion in the deficit, as the federal government tried to keep the financial collapses of Bear Stearns and Lehman Brothers from rippling across the economy. Today, with the deficit at its highest level in history and a fight over austerity measures, taxes, and the debt ceiling brewing, the nation's modest recovery is at risk. Among the possible results of the political grudge match now under way in Washington is that the next five years could look like a rerun of the last five. 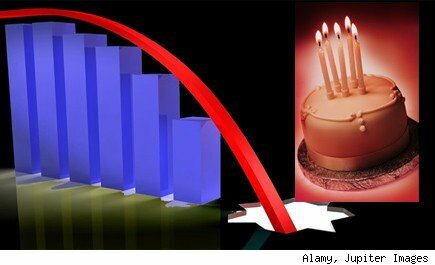 Perhaps next December, we'll be able to look back on this fifth anniversary of the Great Recession as having preceded a year in which the economy finally improved enough to revive America's optimism ... or perhaps we'll be remembering it as brief respite before the economy once again tumbled over a cliff.